29/3/12 - Acquisition - Amsterdam, Rijksmuseum - In our review of the Maastricht fair, we pointed out a superbe bronze ewer by Henri de Triqueti on the Yates-Trebosc-van Lelyveld stand. It has now been purchased by the Rijksmuseum in Amsterdam. A wealthy artist, Henri de Triqueti, unlike many other Romantic sculptors, had no need to produce bronze editions for business endeavors. As Anne Dion-Tenenbaum mentions in her catalogue for the exhibition at Montargis and Orleans in 2007 (see article), he worked a bit like a Renaissance artist and produced only a few replicas of his models. The ewer acquired by the Dutch museum shows episodes of the story of Joseph on two sides : Joseph Explaining the Dreams, symbolizing Hope and Joseph in Prison with the Cup-bearer and Pantler, representing Patience. Two figures are shown locked in an embrace directly under the beak : Justice and Peace. 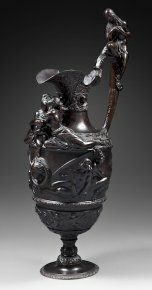 Although this model can be found, exceptionally, as of 1867 in the catalogue of art bronzes by Thiébaut who had pursued the work of Eck and Durand, it is likely that the ewer now acquired by the Rijksmuseum, because of its high quality, was produced under the supervision of Triqueti by Louis Richard alone or as a collaboration of Richard, Eck and Durand. Again, according to Anne Dion-Tenenbaum, only two other versions of this ewer, known as Hope, Patience, Peace and Justice, are known ; one is at the Musée Girodet in Montargis, the other at the Louvre. It always appears with a companion piece, of the same model but with a head in place of the figure perched on the handle . However, we should point out that the author is not very clear on the number of replicas found, when she writes : "We now know of two pairs of this type, and a Joseph ewer." What is this additional Joseph ewer and where is it held ?